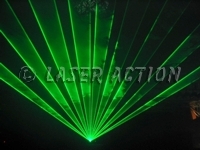 Laser Action have been supplying breathtaking laser displays for entertainment over many years, using the latest equipment currently available we are able to produce stunning effects that will totally transform your production. 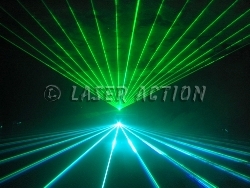 Laser light is without doubt one of the most radiant and effective forms of lighting used for entertainment purposes or special effects, along with versatile control systems our operators can add impact and create electrifying atmospheres. 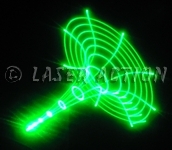 Fans, sheets and beams of laser light have sliced through the air at firework displays, celebrations, parties and disco's both indoor and outdoor through the UK, dramatically enhancing events for our clients and leaving their audiences captivated at the hypnotic elegance that a laser display creates. Lasers are not just limited to entertainment applications; exhibitions and product launches are just two areas that have benefited from the use of a laser. Logo's, text or images can be projected onto walls, screens or even buildings making it a very impressive promotional / advertising feature or to draw attention to a specific location or product. 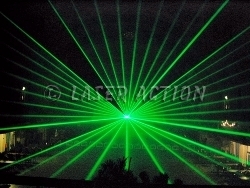 Laser Action can offer the perfect solution, from corporate branding to concerts, grand openings to theatre productions, we can deliver what it takes to make the difference.